All-in-one mutifunctionality daybed and coffee table. Normally used as daybed couch, also could be used as coffee tea table with sofa seats when lift the wooden board. 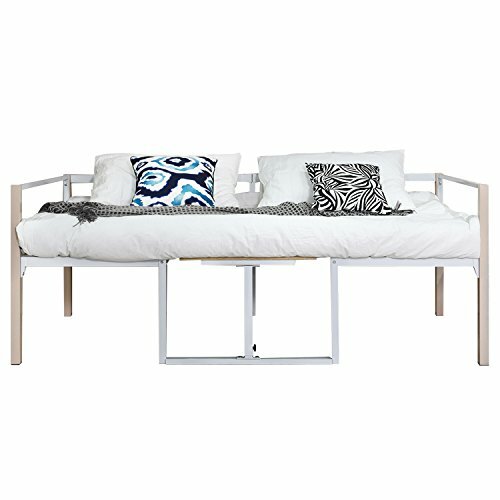 As a normal daybed, has more two legs and one wooden board support, will be more sturdy and no squeak.Strong steel tubing construction and Full-length guardrails provide the safety and comfortable sleep environment. Convenient and multipurpose: when you lift and fixed the wooden board, the daybed will be as coffee side table, dining table, reading table in home and office. Compact size, space-saving and lightweight design. Box spring replacement, the steel bed frame features providing solid support for the mattress, will increase mattress life while eliminating the need for a box spring. Bed frame comes flat-packed in one box, please follow instructions for proper assembly, no more tools reqiure, all included in the package. MoMo? Mobil-Movementess? Mobile-Muvumentesu? Basic style? Data observed for housing? Eins (Ainsworth)? Head type? No.777 "Anjenu"